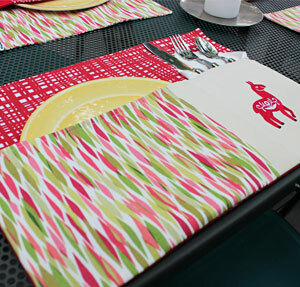 Keep paper plates and napkins from blowing away at your next picnic with a clever pocket placemat! 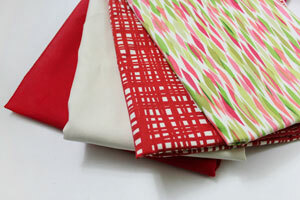 Simply pick your favorite fabrics and a fun embroidery design to whip this project up in a flash. The pocket is the ideal way to store your utensils until it's time to dig in, and the placemat will catch any crumbs or spills for easy clean-up. Read on to learn how to make this picnic-perfect project! 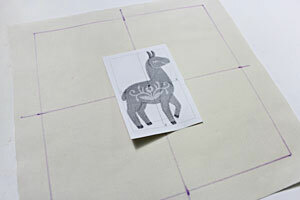 For my placemat, I used the small size of the Swedish Llama Silhouette design. Any design in the small size of the Swedish Animal Silhouettes would work well too, or visit our Food and Wine department for more delicious ideas. 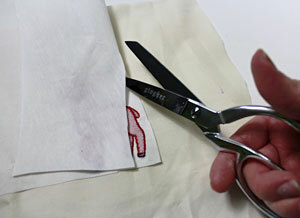 To get started, prepare the fabric for the embroidered section of the pocket front (the section on the right side). 9" x 9" square on the solid-colored fabric. Measure and mark the center of each side of the shape and draw lines connecting the marks. Where the lines meet is the exact center of the shape. Create a paper template of the design by printing it at full size using embroidery software. 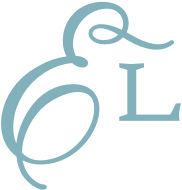 If you are new to working with templates, click here for more information. 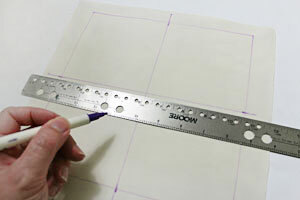 Poke a hole in the center of the template and align it with the center point on the fabric. Make sure the design fits well inside the shape -- there should be at least one inch in-between the outer edges of the design and the edges of the shape. Remove the template and spray a piece of medium weight cutaway stabilizer with temporary adhesive. Smooth the fabric on top and hoop the fabric and stabilizer together by aligning the marks on the hoop with the lines on the stabilizer. Attach the hoop to the machine and load the design. Move the hoop so that the needle is aligned with the center point on the fabric. Embroider the design. 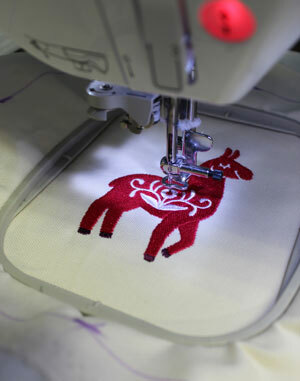 When the design has finished, trim away the excess stabilizer on the backside of the embroidery. Cut out the shape. To prepare the fabric for the left section of the pocket front, cut a piece of the print cotton fabric to 12" wide by 9" high. Align the embroidered pocket piece on top, right sides together, with the embroidered piece aligned with the right side of the print fabric piece. Pin in place and sew a 1/2" seam along the pinned edge only. Press the seam with an iron. 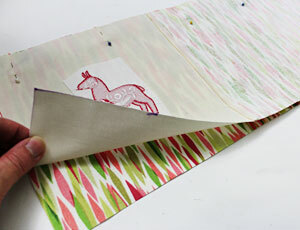 To prepare the back of the pocket, cut a piece of the print fabric to 20" wide by 9" high. Align the assembled front piece on top of the back fabric, right sides together, pin in place along the top edge and sew a 1/2" seam along the top edge only. Press the seam, fold the fabric together (wrong sides together) and top-stitch a 1/8" seam along the folded top edge only. 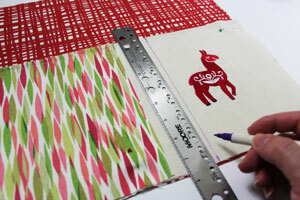 To prepare the back of the placemat, cut two pieces of the print fabric to 20" wide by 15" high. Lay one of the pieces flat with the right side facing up. Align the pocket on top of the back fabric with the bottom edges aligned. Pin in place. Measure and mark 7" in along the top and bottom edges of the pocket starting along the right side. Draw a line connecting the marks. 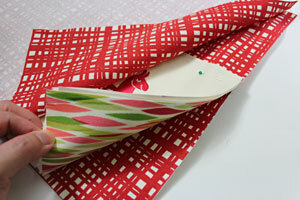 Sew a seam along the line you just drew -- this creates the small utensil pocket. Align the remaining back fabric piece on top of the assembled back fabric/pocket piece (right sides together, pin in place) and sew a 1/2" seam along the outer edges of the shape leaving about 5" open along the top edge. 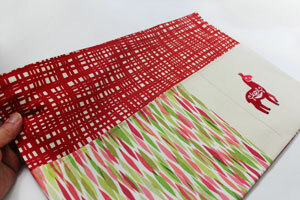 Trim the seam allowance at each corner and then turn the placemat right side out. 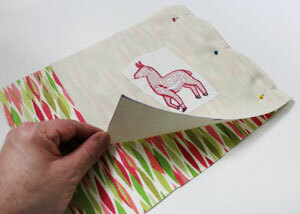 Press the seams; turn the fabric of the opening in 1/2" and press. Top stitch a 1/8" seam along the edges of the top section only to finish. 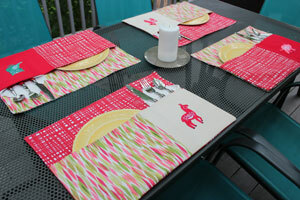 The pocket placemat is great for picnics, park tables, and even a barbeque on your back porch! 4.87" x 6.57" | 3.87" x 3.87"
7.80" x 7.80" | 6.91" x 7.05" | 5.87" x 6.30" | 4.87" x 5.20" | 3.87" x 3.86"
7.80" x 7.81" | 6.91" x 7.11" | 5.89" x 6.22" | 4.89" x 5.23" | 3.87" x 3.90"
5.87" x 6.98" | 4.86" x 5.76" | 3.90" x 3.70"